We love having potatoes for breakfast. On Saturday we like to have a real breakfast...eggs, potatoes, bacon/ham, fresh garden salsa, coffee, orange juice and maybe something sweet(not always). I like making these potatoes first as it takes about 4o-45 minutes in the oven to bake. It gives me plenty of time to set up the table while they are baking as well as make the rest of the menu. I like to use these potatoes as well in egg burritos. 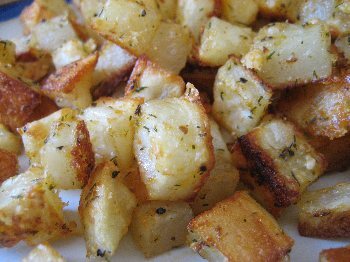 These potatoes are versatile .... they do very well as a side dish for lunch or dinner. Preheat oven to 425 deg. Peel and wash potatoes. Dice potatoes in small cubes (about 1/2 inch thick). Place in a medium bowl. Add olive oil and toss to coat all potatoes. Add the rest of the ingredients and toss to mix. Place potatoes in a single layer in a 13x9 pan. Use parchment paper for easy cleanup ...and so that the potatoes do not stick to the bottom of the pan. Bake for 30-40 minutes or until nicely golden brown.